The Skinny: A compelling, absurd, darkly funny and powerful documentary with a fascinating subject, The Emperor's Naked Army Marches On is not a film one can easily forget. Director Kon Ichikawa's classic 1959 war drama Fire on the Plains and its source novel by Shohei Ooka portray starving Japanese soldiers in New Guinea resorting to cannibalism at the end of World War II. While the novel was part fictional, the truth about cannibalism in New Guinea gets its time of day in the 1987 documentary The Emperor's Naked Army Marches On, a gripping film that proves truth is sometimes really stranger than fiction. Directed by Kazuo Hara, the film offers an intensely fascinating subject in the form of Kenzo Okuzaki, a World War II veteran who already had quite a past before filming: he served 13 years in prison for killing a real estate agent in the 1950s, then he was sent to jail on several other occasions for slinging steel marbles at the Emperor, passing out pornographic handbills featuring the Emperor, and for plotting to kill the Japanese Prime Minister. This is the type of man that has to inform the police just to leave his city of residency. Filmed between 1982 and 1987, the film chronicles Okuzaki traveling around Japan to investigate the truth behind the execution of two soldiers that occurred 23 days after the war had ended. Driving around a wagon that has a huge sign on the top with written derogatory messages against the Emperor and the Prime Minister, Okuzaki spends most of the film tracking fellow soldiers down one by one to interview them about the executions. From then on, the film becomes a series of prolonged interviews where the officers beat around the bush to avoid telling the truth ("Why would you want to disturb the dead by bringing it up?" one officer asks angrily.). However, Okuzaki uses persistence and incoherent interrogation methods, which sometimes even include violence and confinement, to break them down. Of course, he knows he's crazy; he even volunteers to call the police on the interviewees' behalf. But that doesn't stop his insistence in getting the truth. Even when the family members of the deceased decide to stop accompanying Okuzaki, he simply uses his friends and his wife to impersonate them so he can continue playing the sympathy card. The most impressive aspect of The Emperor's Naked Army Marches On is Hara's methods. 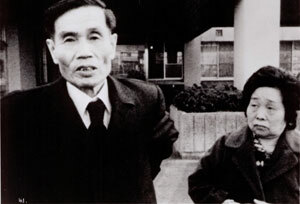 While the film's production values are simple (the boom mic is visible in several instances), Hara keeps his camera at the distance of a spectator. Even when Okuzaki pins an old man to the ground and starts punching him, Hara simply stands outside, refusing to get involved while the poor man's wife can only grab Okuzaki's arm while saying "no violence". While Hara later admitted that he strongly disliked Okuzaki by the time filming had ended, the film's tone is surprisingly balanced. As a result, Okuzaki's image is rather bipolar. His insistence in getting the truth behind the possible wrongful executions to console his dead comrades' souls is admirable. On the other hand, early scenes of him driving around the Imperial Palace in his wagon and confronting the numerous police officers show that he might not be the most mentally balanced veteran in Japan. No matter how you may see Okuzaki, the film is more interesting due to its central character. Notes:  Kenzo Okuzaki passed away in 2005, almost 20 years after the making of the film.  Hara said that Okuzaki was actually far more incoherent, and that he only sounded sane thanks to "clever editing".  Kenzo Okuzaki also ran for public office in 1983 during the filming. His official campaign video is on Youtube here.  SPOILER ALERT (highlight text to read): Okuzaki actually informed Hara about his plan to murder at the end and asked him to film it. Hara declined.